The Roxbury Puddingstone, sometimes called Roxbury Conglomerate, became the state rock in 1983. Roxbury Puddingstone is a puddingstone or conglomerate stone that forms the bedrock underlying most of Roxbury, Massachusetts, and now part of the City of Boston. Puddingstone (aka pudding stone, plum pudding stone) is a common name used mainly in England for a conglomerate consisting of well-rounded clasts whose colors are in such marked contrast with the abundant fine-grained matrix or cement that the rock suggests an old fashioned plum pudding. A prime example is the lower Eocene Hertfordshire Puddingstone in England, composed of black or brown flint pebbles cemented by white silica with or without brown iron hydroxide. Roxbury puddingstone did not originate in the Boston area. 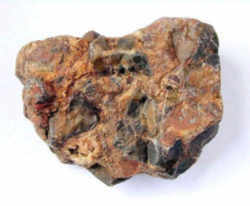 No one knows for sure where this rock formed; it has some affinities with rocks found in West Africa, and also shares traits with some South American rocks. Geologists do agree that the Roxbury Conglomerate was deposited between 600 million and 570 million years ago somewhere in the Southern Hemisphere. Plate tectonics carried it into North America about 200 million years later. The Roxbury Conglomerate, also informally known as Roxbury puddingstone, is a name for a rock formation that forms the bedrock underlying most of Roxbury, Massachusetts, now part of the city of Boston. The bedrock formation extends well beyond the limits of Roxbury, underlying part or all of Quincy, Canton, Milton, Dorchester, Dedham, Jamaica Plain, Brighton, Brookline, Newton, Needham, and Dover. It is named for exposures in Roxbury, Boston area. Roxbury Puddingstone, which is found only in the Boston Basin. 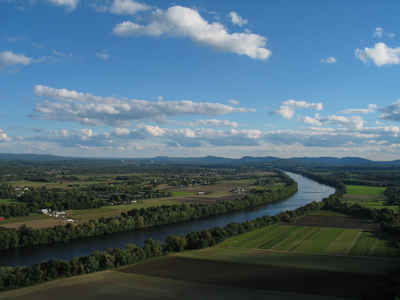 The Roxbury Conglomerate (or "puddingstone" as it is often called, due to its resemblance to an old fashioned fruit-filled pudding), is an ancient river gravel which has been cemented into a hard rock by natural mineralization. The gravel was laid down in the beds of rivers hundreds of years ago. 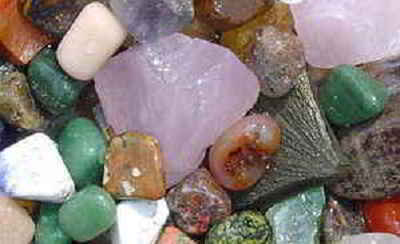 The individual round pebbles, which can still be seen, represent the various types of rock that existed in the area at that time. 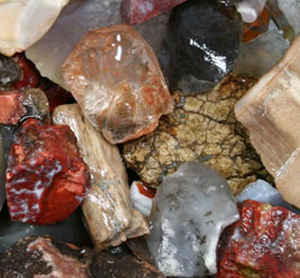 These include volcanic rocks, granite and quartzite. 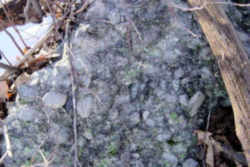 Over time the accumulation of younger deposits on top of the gravel eventually bonded the gravel together in the same manner as cement hardens to form concrete. This natural concrete was then squeezed and deformed by deep-seated earth forces and slowly unearthed by surface erosion. Some of this erosion was accomplished by the glaciers that existed here until as recently as 12,000 years ago.